If you read this blog regularly you will know that I struggle with and have doubts with a lot of the churches teachings. I am a convert, and I have read multiple history books, and found out all the good and bad of the church, and knowing both the good and bad, I still am and always will be a Mormon. Even though I'm a fully converted Mormon, I still struggle with my doubts. That is what I want to talk to you about today. General Conference was this past weekend, and as I was watching I had written a question in my journal. It stated: "How can I know that I'm okay even though I don't KNOW fully all the teachings of the Gospel?" That questions was followed up by "How can I increase my Faith?" Those were the only 2 questions I wanted answered. As General Conference was on Saturday and Sunday, I was getting down at the fact that no one had said anything about my questions. Finally the last session on Sunday afternoon started and Jeffrey R. Holland got up to speak. I was so excited as he was the Elder that I had met just a month before this. As he stood, I was instantly filled with the same feelings of peace, love, and kindness, as I was the day I hugged him. He is truly a man of God, and I KNOW that. He started speaking about "Believing". It was a subject that is very near and dear to my heart, for I believe that the church is true, I just don't know 100% that everything is true, but I believe that God will teach me. His talk was all about how your doubts and questions are valid, and when they come up you need to address them and get them answered. He also spoke about how we are not evil or bad people if we have thoughts. We need to focus 1. on what we know and believe and 2. be true and have integrity to the faith and knowledge you do have. The last little while I haven't posted on the Mormon Housewife because I have been struggling with worrying that I wasn't a good Mormon because I don't believe all of their teachings, but his talk spoke to my heart and confirmed to me that I am a good Mormon, and that my Heavenly Father is not only pleased with me, but that he loves me. Because of my knowledge and desire to learn more and grow my faith, he is willing to teach me, and I will soon have my questions answered in his time, if I remain faithful. It was a talk that taught me so much about who I am, and so much more about the love that my Father in Heaven has for me. I want each of you to know that if you have questions and doubts, that it is okay. You are not evil and bad for having these concerns. They are valid, and they are important to you. Seek out those leaders that can help you answer your questions, and lead you on the path that you so desire. If the desire in your heart is good and pure, your father in Heaven is going to teach you and show you the things that you need to know so that you can be comforted in your faith. Continue to have faith and pray, and know that he will answer you in his time, and as he see's fit. Pray for strength and he will strengthen you. Those of you who read this blog know that I have doubts and a lot of questions concerning the church. You know of my struggle and battle that I overcome on a weekly basis. You also know the intentions of my heart are pure and are going in the direction of the hope of finding the church to be true. I am a convert and though I believe in the church, I don't yet know that it is 100% true. I hope that Heavenly Father will teach me it is through my faith. This past weekend was general conference. 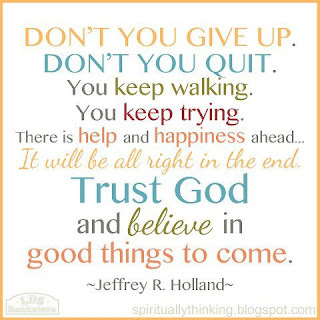 Elder Jeffrey R. Holland got up to speak, which I was so excited about because I had met him the month before. In preparing for this general conference I had written down 2 questions. 1. Am I a good Mormon even though I have questions and doubts? 2. How can I grow my faith and learn to KNOW the truths of the things I doubt? As the talk started I was instantly struck by his topic. The topic of believing. He told a story of a man who's son had died and Christ came to him. He begged Christ to heal him and Christ asked him if he believed. He said, Yay I believe, help thou thine unbelief. It was beautifully poetic to me. As this man is begging Christ to heal his son he is so humble to admit that he believes a little but he still doubts. Immediately Christ raises his son from the dead. We must always start with the things we know and go from there. Don't worry about the things that you question and doubt, because those will come later. Focus on your beliefs and what you know to be true. Your Heavenly Father knows your heart as he knows mine and because we have faith in him and believe, he will teach us the things that we do not yet know. He will mold and shape our hearts and minds if we stay faithful to him, and ask him with our sincere hearts to teach us the things we so desire. I encourage you to seek out leaders who can answer your questions, and to realize just as I did yesterday, that you are not evil because you have questions about the church. They are valid and important, and you need to get them answered so you can move on. The greatest minds in the church are the ones who are continually learning and asking so that they can gain a better knowledge and faith to teach and help others. You are not alone in your quest, just as I know I am not. I know that my Father in Heaven loves me and that through my work, faith, and diligence he is going to teach me that the things I question are either true or not. Either way I believe in my church and I am happier when I am living the teachings of the Gospel vs. not. He knows my heart. He knows that I won't leave the church, and I know that he will teach me so I can become a messenger in his hands. Don't hate yourself because you don't know everything you want to. Don't be angry that you question. Have patience and faith and know that he is there. Know that he hears you and loves you, and that he will answer your prayers. You will be taught, and those things you believe will soon become things you know.